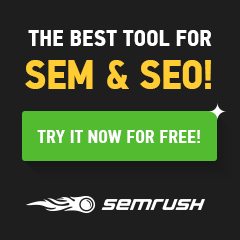 I have been on the edge about buying SEMRush for a while, it seems like a cool product but the entry level price is quite high. Is it worth the money or are there better things to spend it on? Yes, I think it is well worth buying. It is a great tool for monitoring your website. The backlink audits can be very useful when you are putting the effort into a backlink campaign. IF you are just running a single website, it seems like a lot of money but you will find it useful all the same. If you manage more than one site then it will become a lot more valuable. The pro price plan is the cheapest and while it might still seem expensive, is worth it. Try it out for a month and see how you find it. If you think it is good, you can keep going, if it isn’t any good, cancel your subscription.